I joined the police for the first time 33 years ago. Lots of stuff happened and I left about 3 years later to go traveling, which is not that unusual. I did not however buy a pair of flip flops, dress like a pirate and disappear over the horizon in a camper van. Instead I asked the Queen to kindly give me a job. Well, maybe I didn’t ask the Queen directly but the application forms had “Royal” written all over them. I got the job, moved out of London and off I went in a grey ship. It was fun, amongst a lot of other things. I left about 16 years later. 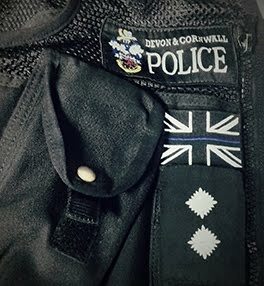 On a Monday I joined the police again, except this time I was living in Cornwall and not London. I’ve been here ever since and lots of stuff is still happening in Cornwall and the Isles of Scilly. I have often thought that some of the happening stuff may be useful or interesting to someone. And now I have a desk job and seldom wear a funny hat or drive quickly (and safely!) I thought that every week or two I would write this blog. An “Inspector blogging” was born. That is the introduction written, and I look forward to sharing some of the stuff that is going on in April here in the sunny Duchy. PS - I wanted Inspector Gadget, but that’s been taken. PPS – Drive safely, be kind to each other, don’t pinch stuff.